It’s natural for people to think that the grass is greener on the other side. However, more often than not, they discover the new lawn is dried up and brown. 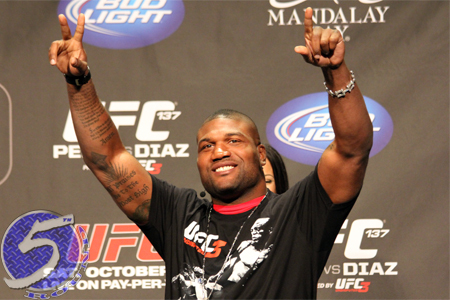 That’s a hard lesson it appears former UFC light heavyweight champion Quinton “Rampage” Jackson (pictured) has just figured out. “Just a thought.. But I’ve learned a big lesson in life and business: sometimes u should just stay with the devil u know @ufc,” Jackson tweeted late Monday night. Jackson essentially completed his contractual obligations with the UFC following his January 2013 unanimous decision defeat to Glover Teixeira. Although there was some fine print at the bottom of Jackson’s contract that allowed the UFC to match any offer that came across his table, the planet’s premier mixed martial arts promotion opted to part ways because of the disrespectful comments he made leading up to his final Octagon fights. The 36-year-old’s three-fight losing skid certainly didn’t make him a top free agent priority, either. Viacom quickly pounced on Jackson, bringing in the veteran to perform in Bellator MMA and TNA Wrestling. Jackson’s professional wrestling career was short-lived and he’s not happy with the directing his MMA career his headed after Bjorn Rebney, Bellator’s former president and Jackson’s biggest supporter, was fired this past summer. Jackson has won all three of his scraps since joining Bellator, with his most recent coming against bitter rival Muhammed “King Mo” Lawal in May. What’s next? Nobody really knows. Jackson just knows he’s not happy. Then again, what else is new?